If you are planning a vintage rustic wedding, the accessories that you use will want to reflect that theme. 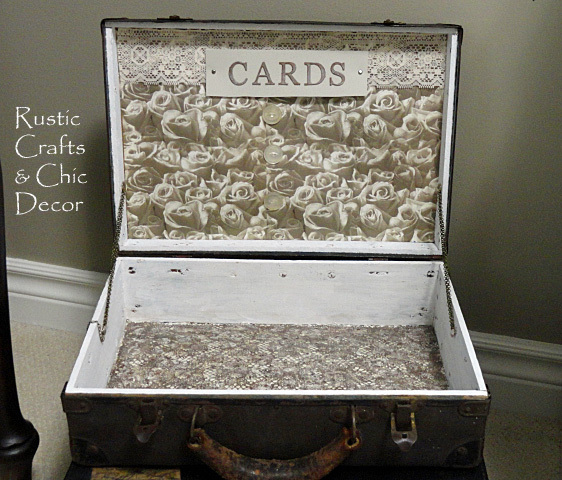 I’ll show you how to make a vintage suitcase card box to display at the reception. Gift card boxes are a good thing to have on hand at a wedding reception, or other party, to hold all of those cards received in one place. For something a little more unique than the average box, a vintage suitcase works great for a collection point. When the party is over, just snap the case shut and carry the case home! 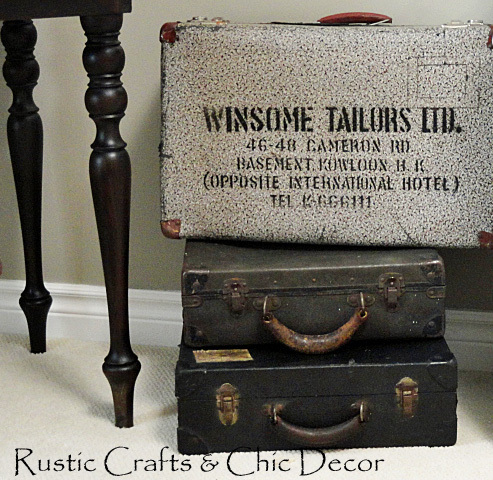 I happen to collect vintage suitcases to display in my home for decor. I also happen to have two daughters getting married next year. Therefore, I decided to start making over the inside of my very old suitcases to make at least one of them suitable for a gift card box to use at one or both of the weddings. The problem with many of the vintage suitcases that I have found is that they look pretty cool from the outside and a complete disaster on the inside. I started with my smallest suitcase which was a nice aged brown case with leather handle and rusted buckles. You would think that the inside had just as much character…..but no! It was lined with a very dirty blue floral fabric that was also torn in several spots. Before even thinking to take a picture, I began tugging at the fabric. It easily tore away from the wooden frame and I quickly rid the inside of its floral covering leaving me with a plain wooden box…..in need of decorating! The first thing that I did was to put a nice fresh coat of white paint on that wood. I then decoupaged some neutral rose craft paper to the inside lid with Mod Podge matte finish. To finish off the upper edge, I added a lace border with tacky glue. Since I had a seam between two pieces of paper that I used, I glued three medium sized mother of pearl buttons at the seam to look like the pieces were buttoned together. The suitcase would need a label to signify that it was a gift card box, so I made a sign with thick cutout letters painted with raw umber paint with a light coat of metallic silver over the top to make it blend with the paper. 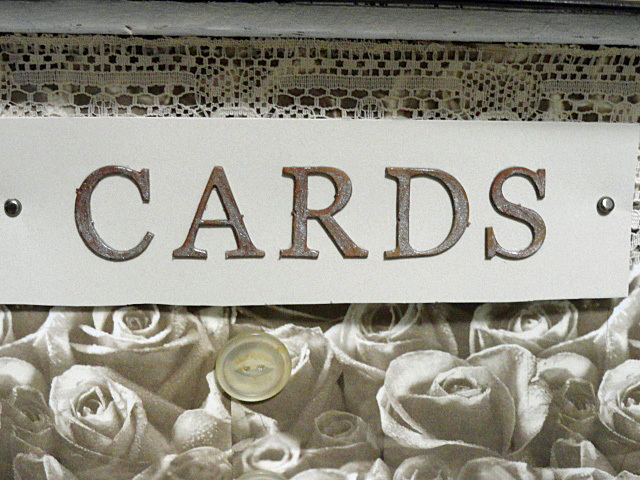 I attached the sign to the lace with small brad clips. The leather straps that were supposed to keep the lid from falling all the way back when open, were missing. 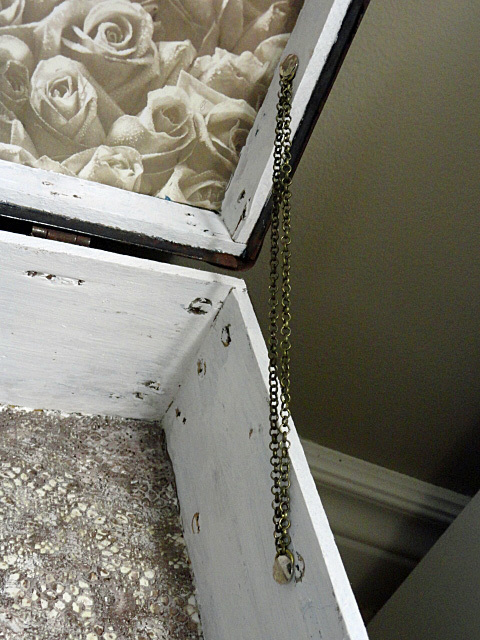 I replaced them with two bracelet chains attached with tacks pounded in tight. I also decoupaged lace to the bottom of the inside of the box and then painted over it with a couple of paints to blend with the paper on the lid. To further accessorize your rustic vintage wedding, check out these rustic wedding crafts. What a beautiful memento for your daughters! I’ll have to keep my eyes open for a nice (but not too nice) vintage suitcase! I was just looking at some this weekend! I hope you find just the right one!